Over the years, a number of buildings and other landmarks around the University of British Columbia campus have been named for persons or groups associated in some way with the University. Some facilities are named to commemorate significant financial supporters; others are named for historical or memorial reasons after prominent faculty, administrators, or alumni. In one case, a faculty (Sauder School of Business) is named separately from the building where it is based (Henry Angus Building). This list is organized by name, street address, and facility type (Building – Academic, Building – Hospital, Building – Library/Museum, Building – Residential, Building – Theatre, Faculty, Interior Space, Landmark, Neighbourhood, Park, Road, and Sports Facility). Allard, Peter A. Allard Hall – 1822 East Mall Building – Academic Named after Peter Allard, UBC Alumnus, after his $11.86 million gift to the Faculty of Law in July 2011. Replaced George F. Curtis Building in 2011. See also: UBC Buildings Index. Allard, Peter A. Peter A. Allard School of Law Faculty Named after Peter Allard, UBC Alumnus, after his $11.86 million gift to the Faculty of Law in July 2011. Angus, Henry Forbes Henry Angus Building – 2053 Main Mall Building – Academic The Henry Angus Building was built in 1965 with an addition in 1976. It was the first “skyscraper” on campus and originally housed the Faculty of Commerce and all of the Social Sciences. It was named after Henry Forbes Angus, commerce professor and first Dean of Graduate Studies. Barber, Irving K. The Irving K. Barber Learning Centre – 1961 East Mall Building – Academic Irving K. “Ike” Barber was a Canadian forest industrialist and philanthropist whose $20 million donation to UBC was the major funding for the Irving K. Barber Learning Centre. Replaced Main Library in 2005. Beaty, Ross and Trisha Beaty Biodiversity Centre – 2212 Main Mall Building – Academic Erected 2009. UBC Alumni Ross and Trisha Beaty donated $8 million toward the Biodiversity research centre in 2005. Ross Beaty is a geologist and mining entrepreneur with Pan American Silver Corporation. His wife Trisha is a local physician who majored in zoology. See also: UBC Buildings Index. Belkin, Morris and Helen Morris and Helen Belkin Art Gallery – 1825 Main Mall Building – Library/Museum The facility was a gift from Morris and Helen Belkin, and the name commemorates their generous donation. Bell, Jack Jack Bell Building (School of Social Work) – 2080 West Mall Building – Academic The Jack Bell Building officially opened on September 17th, 1993, and is named to honour local philanthropist Jack Bell. Binning, B.C. B.C. Binning MFA Studio – 6363 Stores Rd. Building – Academic B.C. Binning, a prominent Canadian artist and architect, taught at the UBC School of Architecture, and helped found the UBC Fine Arts Department. Binning, B.C. Binning Road Road B.C. Binning, a prominent Canadian artist and architect, taught at the UBC School of Architecture, and helped found the UBC Fine Arts Department. Birney, Earle Birney Avenue Road Named for UBC alumnus, writer, and founder of the UBC creative writing programme. Brimacombe, Keith Brimacombe Building – 2355 East Mall Building – Academic Keith Brimacombe was a professor in the Faculty of Applied Science with an international reputation as a leader in metallurgical process engineering. During his tenure at UBC, the former director of UBC’s Centre for Metallurgical Process Engineering built a large collaborative research group in metallurgical process engineering consisting of about 70 faculty, graduate students, research engineers and technicians. See also UBC Public Affairs. Brock, Reginald Walter Brock Hall – 1874 East Mall Building – Academic The Brock family donated funding for the construction of the hall. Named in honor of Dr. R.W. Brock, Dean of Applied Science and his wife Mildred, who died in a plane crash in 1935. See also: UBC Buildings Index. Buchanan, Daniel Buchanan Tower – 1873 East Mall Building – Academic Built in 1972. Named for former Dean of Arts and Sciences, died 1950. See also: UBC Buildings Index. Buck, Frank Frank Buck Park Park Named for Frank Buck, who served as UBC’s horticulturalist and landscape architect 1920-49. Chan, Tom and Caleb Chan Centre for Performing Arts – 6265 Crescent Road Building – Theatre Donation of $25 million from the Chan Foundation of Canada, RBC and the BC Government. Clement, Frederick Clement’s Green – 6279 Eagles Drive Building – Residential Residential building in Hawthorn Place neighbourhood. Named for Professor of Horticulture and Dean of Agriculture (1919-49). See also: Google Maps. Dempster, Hugh Hugh Dempster Pavilion – 6245 Agronomy Road Building – Academic The Pavilion is named after Hugh Dempster, a former computer science professor, who was renowned for his compassion for undergraduates and was one of the original four faculty members to join the Department in 1968. See also: Wayfinding UBC. Detwiller, Lloyd F. Detwiller Pavillion 1 and 2 – 2255 Wesbrook Mall Building – Hospital The Detwiller Pavilion was built in 1968 and was originally called the Psychiatric Unit. Named in commemoration of Lloyd Detwiller’s two decades of services to the Health Services Centre. Forward, Frank A. Frank Forward Building – 6350 Stores Road Building – Academic The Frank Forward Building was built in 1968 and is named after Frank A. Forward, a pioneer in metallurgy and the Head of the University’s Department of Metallurgy from 1945 to 1964. See also: UBC Buildings Index; Frank Forward’s biography. Friedman, Sydney and Constance Friedman Building – 2177 Wesbrook Mall Building – Academic The Friedman Building was constructed in 1961 with an addition in 1967. It was donated by the Constance Livingstone Friedman & Sydney Friedman Foundation. Graham, Rodney Rodney Graham Millenium Sculpture Pavilion – 1940 Main Mall Landmark Rodney Graham is a Vancouver artist. He designed the art installation in the facility. Gray, Mabel Gray Avenue Road Named for Mabel Gray, long-time Professor of Nursing and Health at UBC (1925-41). See also: UBC Archives. Green, Cecil Cecil Green Park House – 6251 Cecil Green Park Road Building – Academic This house, formerly known as “Kanakla” (house on the cliff) was built in 1912 in the Tudor Revival and Arts and Crafts Style for Edward Davis, a Vancouver lawyer. In 1967 Cecil and Ida Green purchased the house, had it renovated and restored, and donated it to the university. Cecil Green attended UBC for 2 years (1918-20) before transferring to MIT and going on to become a co-founder of Texas Instruments. See also: UBC Buildings Index. Green, Cecil Cecil Green Park Road Road Named for the house donated to UBC by Cecil and Ida Green. Eagles, Blythe Alfred Eagles Park Park Blythe Alfred Eagles was the Dean of Faculty of Agriculture (1949-67), Head of the Dept. of Dairying (1936-1955), and Chairman of the Division of Animal Science (1955-1967). The park is in the Hawthorn Place residential area. See also: UBC Archives; Google Maps . Eagles, Blythe Alfred Eagles Drive Road Blythe Alfred Eagles was the Dean of Faculty of Agriculture (1949-67), Head of the Dept. of Dairying (1936-1955), and Chairman of the Division of Animal Science (1955-1967). The road is in the Hawthorn Place residential area. See also: UBC Archives; Google Maps . Hamber, Aldyen Aldyen Hamber House (Place Vanier Residence) – 1935 Lower Mall Building – Residential Aldyen Hamber was the wife of Eric Hamber, former Lieutenant-Governor of B.C. and Chancellor of UBC (1944-51). Hawthorn, Harry Hawthorn Place Neighbourhood Harry Hawthorn’s appointment to the faculty of the University of British Columbia in 1947 added Anthropology to the title of the Dept. of Economics, Political Science and Sociology. He was a member of faculty from 1947-76, as well as a director of the Museum of Anthropology. The Hawthorn Place residential neighbourhood was completed in 2007. See also: UBC Archives; Campus and Community Planning; Wayfinding UBC; University Neighbourhoods Association. Hawthorn, Harry and Audrey Harry and Audrey Hawthorn Library Interior Space Harry Hawthorn’s appointment to the faculty of the University of British Columbia in 1947 added Anthropology to the title of the Dept. of Economics, Political Science and Sociology. He was a member of faculty from 1947-76, as well as a director of the Museum of Anthropology. Audrey Hawthorn arrived at UBC with her husband. As long-time curator of MOA she built its collections and established collection and display policies that made it one of the world’s leading anthropological museums. The Harry and Audrey Hawthorn Library is located within the UBC Museum of Anthropology, and serves as the Museum’s reference and research library. Hennings, A.E. Hennings Building – 6224 Agricultural Road Building – Academic The Hennings Building was constructed between 1946 and 1947. The building was known simply as Physics until 1963 when it was re-named to honour long-time UBC physics professor A.E. Hennings. Hennings was a professor at the Department of Physics 1920-1948. See also: Wayfinding UBC; UBC Buildings Index. Kaiser, Frederick Fred Kaiser Building – 2332 Main Mall Building – Academic The Fred Kaiser Foundation for Higher Education provided a significant portion of the funding for the development of the Fred Kaiser Building. See also: Wayfinding UBC; UBC Buildings Index. Kenny, Douglas T. Douglas Kenny Building – 2136 West Mall Building – Academic The Douglas Kenny Building officially opened on May 9th 1984. The building is named after Dr. Douglas T. Kenny who was the Head of UBC’s Psychology Department before going on to become the Dean of the Faculty of Arts at UBC and then the seventh President of UBC. See also: UBC Buildings Index. Khorana, Har Gobind Khorana Park – Wesbrook Place Park Named for first head of organic chemistry programme at B.C. Research Council, instructor in UBC Department of Biochemistry, and winner of Nobel Prize for Medicine in 1968. See also: Google Maps. Klinck, Leonard S. Leonard S. Klinck Building – 6356 Agricultural Road Building – Academic The Leonard S. Klinck Building opened in 1948 as the new Applied Science Building. Since then it has been known as the Engineering Building, the Civil Engineering Building and the Computer Science Building. Its current name honours Dr. Leonard S. Klinck, the first Dean of Agriculture (1914-19) and second President (1919-44). See also: UBC Buildings Index. Koerner, Leon Leon and Thea Koerner University Centre – 6331 Crescent Road Building – Academic The Koerners pledged $600,000 in 1957-58 towards planning and construction of this building, originally known as the Faculty Club. After closing in 1994, it re-opened in 1999. 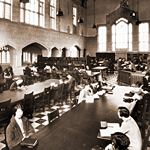 See also: UBC Archives; UBC Buildings Index. Koerner, Thea Thea Koerner House – 6371 Crescent Road Building – Academic Graduate Student Centre, built in 1961 as a gift to the University from Leon Koerner in memory of his wife Thea. See also: UBC Buildings Index. Koerner, Walter C. Koerner Pavilion / Walter C. Koerner Acute Care Unit Building – Hospital Named for Walter C. Koerner, in honour of his lifetime commitment to and support of the University. See also: UBC Buildings Index. Ladha, Abdul Abdul Ladha Science Student Centre – 2055 East Mall Building – Academic Erected in 2006. Funded through a generous donation from UBC alumnus Abdul Ladha, a levy from all UBC Science undergraduate students, the VP Students, and the Dean of Science, the building is a great place for science undergraduates to meet, study, and have fun. Lam, David See-Chai David Lam Learning Centre – 6326 Agricultural Road Interior Space Named for David Lam, the former Lieutenant Governor of British Columbia. Lam, David See-Chai David Lam Asian Garden Park Named for David Lam, the former Lieutenant Governor of British Columbia. Lam, David See-Chai David Lam Site Information Kiosk – Main Mall and Agricultural Road Landmark Information kiosk adjacent to David Lam Centre. Larkin, Peter Larkin Drive Road Peter Larkin worked first in the Fisheries Institute, and then in the Dept. of Zoology; and subsequently he became head of department, then dean of Graduate Studies, and later still, vice-president in charge of research. Larkin Drive is in the Hawthorn Place neighbourhood. See also: UBC Public Affairs; Google Maps. Lasserre, Frederic Frederic Lassere Building – 633 Memorial Road Building – Academic The Frederic Lasserre Building was opened in 1962 and was named after Frederic Lasserre, the first Director of the UBC School of Architecture. The building houses the Department of Fine Arts, the School of Regional and Community Planning, and the School of Architecture. Lee, Simon K. Y. Simon K.Y. Lee – HKU – UBC House (Marine Dr. Residence) – 2205 Lower Mall Building – Residential Dr. Simon K.Y. Lee’s charity and generosity has funded many academic and health related institutions. Simon K.Y. Lee HKU-UBC House is a student residential tower in UBC aiming to foster research and academic partnerships between HKU and UBC and the Hong Kong Ballroom. See also: Wayfinding UBC; UBC Buildings Index. Lett, Sherwood Sherwood Lett House – Place Vanier Residence Building – Residential UBC Alumnus (Arts 1916), first president of Alma Mater Society, former member of Senate and Board of Governors, former Chancellor, Chief Justice of B.C. He was the husband of Evelyn Lett. See also: UBC Buildings Index; Wayfinding UBC. Liu, Jieh Jow Liu Centre for the Study of Global Issues – 6476 North West Marine Drive Building – Academic Named after Dr. J.J. Liu, a distinguished international businessman, to recognize his generous donations through his family’s Liu Foundation made the project possible with contributions from Mrs. Gordon T. Southam. The building is on the site of the old Panhellenic (Sorority) House. See also: UBC Buildings Index. Logan, Harry Tremaine Logan Lane Road In 1920 Logan began teaching at the University of British Columbia where he was successively Instructor, Assistant Professor, Associate Professor, Professor of Classics and Head of the Department of Classics until 1952. See also: UBC Archives; Google Maps. Logan, Harry Tremaine Logan Lane Townhouses Building – Residential In 1920 Logan began teaching at the University of British Columbia where he was successively Instructor, Assistant Professor, Associate Professor, Professor of Classics and Head of the Department of Classics until 1952. See also: Wayfinding UBC. Lord, Arthur Arthur Lord Park Sports Facility UBC Alumnus (1921), former president of Alma Mater Society, prominent student athlete, member of Board of Governors and Senate. Playing field also known as Lord Rugby Field. See also: Wayfinding UBC. MacDonald, John Barfoot J.B. MacDonald Building – 2199 Wesbrook Mall Building – Academic President of UBC 1963-67. Also author of the “Macdonald Report” advocating establishment of SFU, UVic, and community colleges. See also: Wayfinding UBC; UBC Buildings Index; UBC Archives. MacInnes, Isabel Isabel MacInnes Hall (Anthropology and Sociology) – 6303 North West Marine Drive Building – Academic Named after the first woman in the faculty of UBC, and later Head of the German Department. See also: UBC Buildings Index. MacInnes, William Eugene MacInnes Field Sports Facility Named in memory of William Eugene MacInnes, and paid for by a gift from his parents. See also UBC Archives Photograph Collection. MacKenzie, Norman Archibald McCrae (Larry) Norman Mackenzie House – 6565 North West Marine Drive Building – Residential N.A.M. MacKenzie was President of UBC from 1944-1962. The house was built for him and his family. He resided there from 1951-1962, and it became the home of all subsequent University Presidents. The commemoration is in honour of his contributions to the University. MacKenzie, Norman Archibald McCrae (Larry) Norman MacKenzie Centre for Fine Arts Landmark Dedicated in 1965, the Centre is also known as “The Arts Quad”. It consists of four buildings – the Music Building, the Frederic Lasserre Building, the Frederic Wood Theatre, and the Morris and Helen Belkin Art Gallery – linked by a covered walkway and surrounding a central square. See also: featured articles in the UBC Alumni Chronicle (Winter 1965). MacKenzie, Margaret Margaret MacKenzie House – Place Vanier Residence Building – Residential Wife of UBC President N.A.M. MacKenzie. See also: Wayfinding UBC. MacLeod, Hector MacLeod Building – 2356 Main Mall Building – Academic The MacLeod Building opened in 1964 and named after former Dean of Applied Science Hector MacLeod. See also: UBC Buildings Index. MacMillan, Harvey Reginald (H.R.) Information Kiosk – Main Mall Landmark Information kiosk adjacent to MacMillan Building. MacPhee, Earle D. E.D. MacPhee Conference Centre (Henry Angus Building) – 2053 Main Mall Interior Space Named after the former Dean of Commerce, Earle D. MacPhee. Matthews, Whit Matthews Field – Thunderbird Park Sports Facility Named for A. Whitney “Whit” Matthews, Dean of Pharmacy 1952-67. See also: Wayfaring UBC. Mawdsley, Dorothy Dorothy Mawdsley House – Place Vanier Residence Building – Residential Named for M. Dorothy Mawdsley, Dean of Women 1941-59. See also: Wayfinding UBC. McGavin, Allan John Owen Pavilion and Allan McGavin Sports Medicine Centre and Annex Sports Facility Named for Allan M. McGavin, Chancellor of UBC 1969-72. See also: UBC Buildings Index. Mitchell, Doug Doug Mitchell Thunderbird Sports Centre – 2555 / 6066 Wesbrook Mall / Thunderbird Boulevard Sports Facility Canadian lawyer, volunteer and philanthropist, Mitchell played varsity football at UBC, and served as commissioner of the Canadian Football League 1984-89. He was a leading donor for the Doug Mitchell Sports Centre, incorporating the Thunderbird Winter Sports Centre. The Doug Mitchell Thunderbird Sports Centre arena was a host venue for the Vancouver 2010 Olympic and Paralympic Winter Games. See also: Wayfinding UBC; UBC Building Index; UBC Thunderbirds. Mowafaghian, Djavad Djavad Mowafaghian Atrium – Beaty Museum Interior Space A gift from Vancouver philanthropist Djavad Mowafaghian. The atrium houses the largest complete blue whale skeleton in Canada. Mowafaghian, Djavad Djavad Mowafaghian Centre for Brain Health – 2215 Wesbrook Mall V6T 1Z3 Building – Hospital $15 million gift from Vancouver philanthropist Djavad Mowafaghian for a new facility that integrates brain research and patient care. This was the largest gift to date to the UBC Faculty of Medicine. Murrin, Mary Mary Murrin Hall (Anthropology and Sociology) – 6303 North West Marine Drive Building – Academic Former women’s residence, transferred to Anthropogy and Sociology in 1976. Named for wife of W.G. Murrin, former member of UBC Board of Governors and recipient of honorary degree in 1957. See also: Wayfinding UBC. Nitobe, Inazo Nitobe Memorial Garden – 1895 Lower Mall Park The garden honours Inazo Nitobe (1862-1933) whose goal was “to become a bridge across the Pacific”. See also: UBC Botanical Gardens. Osborne, Robert F. Robert F. Osborne Centre – 6108 Thunderbird Boulevard Sports Facility Robert Osborne was a university of British Columbia athlete, coach, and founder of UBC’s School of Physical Education. Osborne retired in 1978 after serving 33 years as the Director of Physical Education. He received the Order of Canada in 1981. See also: UBC Buildings Index. Owen, John John Owen Pavilion and Allan McGavin Sports Medicine Centre and Annex Sports Facility Building was named after John Owen in honour of his contributions to sports in UBC and BC. See also: UBC Buildings Index. Pearkes, George Pearkes Lane Road Named for Gen. George Pearkes, former federal MP and Lt.-Gov. of British Columbia. See also: Google Maps. Purdy, Harry Purdy Pavilion – 2221 Wesbrook Mall Building – Hospital Pavilion is named after Dr. Harry Purdy in honour of him being the first Chairman of the Advisory Committee of the GVRHD and a professor at UBC. See also: Wayfinding UBC. Ridington, John Ridington Room (Irving K. Barber Learning Centre) Interior Space Reading room, originally located in Main Library, relocated to Barber Centre in 2005. Rix, Donald Donald Rix Building – 2389 Health Sciences Mall Building – Academic Canadian pathologist and philanthropist Donald Rix, who gave millions to UBC in funding for bursaries and buildings. Completed in 2000. See also: UBC Buildings Index. Ross, Phyllis Phyllis Ross House (Place Vanier Residence) Building – Residential Named for Phyllis Ross, former Chancellor of UBC and wife of B.C. Lt.-Gov. Frank Ross. See also: Wayfinding UBC. Sauder, William L. Sauder School of Business (Henry Angus Building) – 2053 Main Mall Faculty UBC Faculty of Commerce and Business Administration was renamed Sauder School of Business in 2003, as a result of a donation of a $20 million endowment by Dr. William L. Sauder. He was also Chancellor of UBC 1996-2002. Sauder, William L. Sauder Lane Road Named for UBC benefactor and former chancellor William L. Sauder. Scarfe, Neville Neville Scarfe Building – 2125 Main Mall Building – Academic The centre block of the Neville Scarfe building was constructed in 1962. The office and classroom blocks were added in 1965. The library portion was completed in 1995. The building adopted the name of Neville V. Scarfe in 1973 to honour the former Dean of Education. Sedgewick, Garnett G. Sedgewick Library (Main Library) – 1956 Main Mall Interior Space Undergraduate library added to Main Library in 1960. Named after Garnett G. Sedgewick, professor and head of the English Department (1920-48). Sedgewick, Garnett G. Sedgewick Library – 1958 Main Mall Building – Library/Museum Named after Garnett G. Sedgewick, Head of the English Department (1920-48).Built to replace the former Sedgewick Undergraduate Library in the Main Library building. Built underneath Main Mall, completed 1973. Incorporated into Koerner Library in 1996. See also: UBC Building Index. Shrum, Gordon M. Shrum Lane Road Named for Gordon Shrum, former Dean of the UBC Faculty of Graduate Studies, Professor and Head of the Department of Physics, and later Chancellor of SFU. Shrum, Gordon M. Gordon Shrum Common Block (Place Vanier Residence) Building – Residential Named for Gordon Shrum, former Dean of the UBC Faculty of Graduate Studies, Professor and Head of the Department of Physics, and later Chancellor of SFU. See also: Wayfinding UBC. Sidoo, David David Sidoo Field Sports Facility Named for UBC Alumnus (1982) and former UBC Thunderbirds football player David Sidoo. He is also a benefactor to UBC. See also: UBC Sports Hall of Fame. Sing Tao News Corporation / Sing Tao Foundation Sing Tao Building – 6388 Crescent Road Building – Academic Named for Hong Kong-based Sing Tao News Corporation and the Sing Tao Foundation, which donated funds for the construction of this building housing the School of Journalism. Smith, Michael Michael Smith Park – Wesbrook Place Park The park is named the Nobel Prize winner and Chemistry Professor, Michael Smith. Somerset, Dorothy Dorothy Somerset Studios (Frederic Wood Theatre) – 6361 Univeristy Boulevard Interior Space Named after Dorothy Somerset, UBC’s Theatre and Film Department’s first and founding head. Somerset, Dorothy Somerset Lane Road Named after Dorothy Somerset, UBC’s Theatre and Film Department’s first and founding head. Spencer, Chris Spencer Field Hockey and Cricket Pitch Sports Facility The Chris Spencer Foundation – established by Christopher Spencer, former member of the Board of Governors and benefactor of the University – donated $75,000 for this cricket and grass hockey playing field. See also: UBC Senate Tributes; Wayfinding UBC. Strangway, David David Strangway Building – 5950 University Boulevard Building – Academic Dr. David W. Strangway earned his Ph.D. in Physics from the University of Toronto in 1960. During his tenure at UBC (1985-97), Dr. Strangway worked extensively to position the University as a world-class academic institution. Sturdy, Roseline Roseline Sturdy Amphitheatre (UBC Botanical Garden) – 6804 South West Marine Drive Landmark Opened June 2010. Named for long-time supporter of the UBC Botanical Garden Roseline Sturdy who died in 2008 – partially funded in her memory by her husband Morgan. See also: Faculty of Land and Food Systems. Taylor, Jim Jim Taylor Park Park Named for Jim Taylor, UBC Alumnus (Law 1968), law professor, and founding chair of the University Neighbourhoods Association. Todd, Otis Todd Soccer Field Sports Facility Named for Otis J. Todd, professor (1922-49) and head (1941-49) of the UBC Classics Department. Vanier, Georges Place Vanier Residence Building – Residential Georges Vanier was Governor-General of Canada, and a war hero. See also: UBC Building Index. Volkoff, George Volkoff Lane Road Named for long-time UBC physics instructor, head of the Department of Physics (1961-71), and Dean of Science (1971-79). See also: UBC Senate Tributes. Wall, Peter Peter Wall Institute for Advanced Studies – 6331 Crescent Road Building – Academic In 1994, the Wall Financial Corporation donated $15 million to the Institute for Advanced Studies. The commemoration is in rememberance of Peter Wall’s generosity. It is located adjacent to the Koerner University Centre. See also: Wayfinding UBC. Warren, Harry Harry Warren Field Sports Facility Playing field named for Harry V. Warren – UBC alumnus (Arts 1926, Agriculture 1927), geology professor, supporter of UBC sports, and member of Senate. The playing field is part of Thunderbird Park. See also: UBC Senate Tributes; Wayfinding UBC. Wesbrook, Anne Anne Wesbrook Hall (Anthropology and Sociology) – 6303 North West Marine Drive Building – Academic Named for the wife of UBC’s first president. Built in 1951 as a women students’ residence. Incorporated into the Anthropology and Sociology building complex in 1976. See also: UBC Buildings Index; Wayfinding UBC. Wesbrook, Frank Fairchild Wesbrook Building – 6174 University Boulevard Building – Academic The Wesbrook Building opened in 1951 as the Preventative Medicine Institute. Later, its name was changed to the Wesbrook Building after the first president of the university, Frank Fairchild Wesbrook, who was president of UBC 1913-18, and formerly Dean of Medicine at the University of Minnesota. Wesbrook, Frank Fairchild Wesbrook Mall Road Major road marking the eastern boundary of the Point Grey campus. Named for Frank Wesbrook, first president of UBC. Wesbrook, Frank Fairchild Wesbrook Place Neighbourhood Residential neighbourhood south of the intersection of Wesbrook Mall and West 16th Avenue. Named for Frank Wesbrook, first president of UBC. White, Wayne and William Wayne & William White Engineering Design Centre Building – Academic Twin brothers Wayne and William White are both UBC alumni (Applied Science 1967) – their $2.5 million gift made the building possible. See also: UBC Buildings Index; UBC Public Affairs. Wolfson Trust Wolfson Fields – East and West Sports Facility Installed in 1960. Paid for in part by a grant from the Wolfson Trust (now the Wolfson Foundation), a British philanthropic organization established by Sir Isacc Wolfson. See also: UBC Reports; Wolfson Foundation. Wood, Frederic Frederic Wood Theatre – 6354 Crescent Road Building – Theatre For his major contribution to theatre and the development of theatre in BC. Frederic Wood also founded the UBC Players Club. See also: UBC Buildings Index. Woodward, Charles; P.A. Woodward Library – 2324 West Mall Building – Library/Museum The Library is named after the Woodwards. Together they donated approximately $5.5 million to the development of Woodward Library. Wosk, Yosef Yosef Wosk Reflecting Pool (Museum of Anthropology) Landmark A reflecting pool was always intended for the Museum site when it opened in 1976, but was not completed. Named for Yosef Wosk, major donor towards the project, the pool was eventually completed in 2010. See also: Museum of Anthropology. Wright, Harold Harold Wright Field Sports Facility Named after former UBC field hockey player Harry Wright, who led the fundraising campaign and provided a generous donation towards its completion 2001. See also: UBC Thunderbirds. Wyman, W. Robert Robert Wyman Plaza – 1880 Main Mall Landmark Robert Wyman served as Chancellor of the University 1984-87, and led the “World of Opportunity” fundraising campaign 1987-90. See also: UBC Reports.